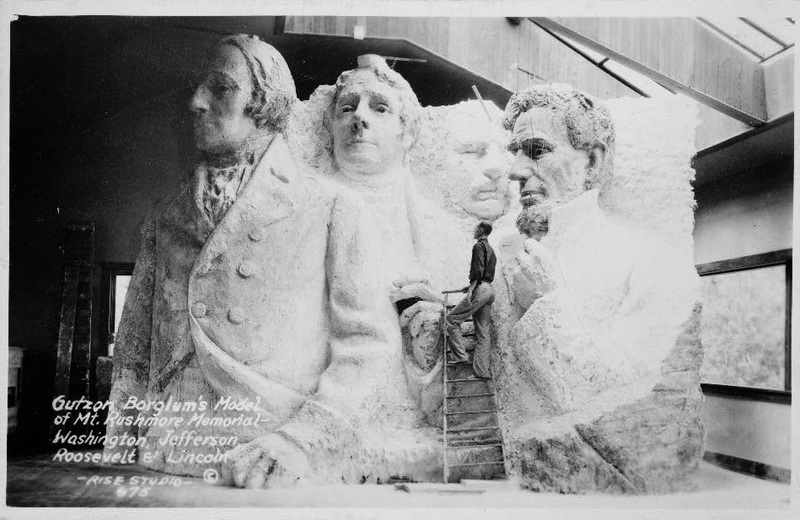 The presidents were to be depicted from head to waist, but the sculpture was scaled back due to insufficient funding. Fascinating picture - I almost didn't see the bloke up the ladder! Funding can be a pest of a thing when it comes art! A good decision as it turns out; these would not have been quite so ‘iconic’ otherwise I feel. Interesting sculpture. I wonder if it still exists and where it is? Agree with Little Nell, it's more iconic the way it is. Yes, it still exists in the museum at the site: http://www.panoramio.com/photo/4503144. So true. We just went there again last summer. It's one of my favorite places to visit in South Dakota, and I can remember my first visit as a child and all the many others after it! I saw a documentary on Borglum on public broadcasting a few months ago. He was a driven and difficult character. The film explained how the Great Depression and the start of World War II, and reluctance from Congress, slowed and finally stopped the completion of Borglum's vision. The statue is impressive. I haven't seen the monument in person, regrettably. I guess you must be little crazy to start a project like that. This is truly a big piece of news. I didn't know about it, before. Thanks Gio, I didn't know it either, you learn something new every day!